Location/ Directions: I-78 East local toward Newark. Get off at RT-21N exit 57- toward Newark/ Newark Airport. Take US-1-Express: proceed for 7 miles. Turn right onto East Milton Ave/ CR-648. Watt Hotel is 0.6 miles on right, across from the Rahway Train Station. About Hotel: 4-Stories, 100-Rooms, Interior Corridors. Railroad View: Excellent View. Hotel is across the street from New Jersey Transit's Rahway train station. A 30-minute train ride will put you in New York City. Although the hotel building looks tall, only 4 floors belong to Hotel Indigo. Since the railroad is elevated try to get a room on the 3rd or 4th floor on the railroad side of the building. Railroads past Hotel: The Northeast Corridor - Amtrak / New Jersey Transit (commuter railroad) / Conrail Shared Assets (Norfolk Southern / CSX). For those who want to witness the Northeast Corridor, this is the place to be. Rahway is located in the busiest section of the N.E.C.with non-stop NJT and Amtrak train's throughout the day. The only freight's on this line are local's, usually operate double-ended (engine on each end of the train). 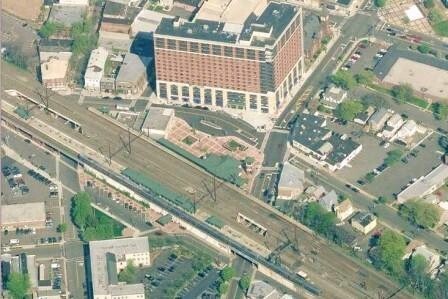 Photo Comment: The aerial image shows a southbound New Jersey Transit train departing Rahway station. The tall building in the top area of the picture is the hotel. 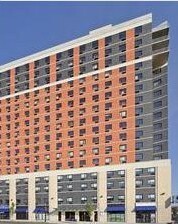 Only the bottom 4 floors belong to the hotel, the rest are apartments. This is the only hotel on the N.E.C. between New York & Washington, DC that is within walking distance to a train station AND has a railroad view. There are several other hotels on this line that offer a walking distance to a train station, but don't offer a railroad view.